Even though Fortnite only exploded in popularity at the start of season 3, Epic's Battle Royale game has in fact had five lengthy seasons so far. While the game launched in September, season 1 didn’t kick off until October 25 and it wasn’t anywhere near as fancy as the current seasons with their battle passes and unlockable cosmetics. Season 1 simply introduced daily challenges to grant you experience points and when you levelled up enough, you were given the privilege of spending V-Bucks in the seasonal store. That’s right - you had to earn the ability to give Epic your money. Now, as everybody knows, Epic releases new cosmetics and emotes like they’re sweets on Halloween. Buying the Battle Pass earns you a plethora of goodies, all the way from tier 1 to 100. Season 5 has meant you can travel around the map at a blistering pace with rifts and ATKs, shotguns are essentially useless and SMGs are unstoppable, and everybody is able to channel their inner Bob the Builder with build battles to the heavens. Which season was the best though? Here is my ranking of the best Fortnite seasons, with all five ranked from worst to best. Looking back on Fortnite season 1 now is hilarious. Nobody knew how to build other than a couple of staircases up the side of a hill, games played out much slower and even the weapon types were limited. Running at 30fps, you could argue that Fortnite looked better back in season 1, but it definitely didn't play as was. Matches always felt repetitive, meaning it lacked identity and individuality early on. Looking back now, it feels strange to feel nostalgic about Fortnite season 1, seeing as it was less than a year ago, but regardless I've got plenty of fond memories of Fortnite's starting season. It introduced some of the rarest and most desired skins in the game such as Renegade Raider, Skull Trooper and Ghoul Trooper, and experiencing the game back then has allowed players to realise just how far Fortnite has come in such a short space of time. It’s difficult to argue that season 1 shouldn’t be counted as one of the worst seasons though. It’s almost like a completely new game now and while it was still fun back then, it’s not reminiscent of what Fortnite is anymore. Fortnite season 4 was perhaps the most underwhelming. The meteor ploughed into the island and obliterated Dusty Depot, smaller craters were left dotted around the map, but it wasn’t particularly exciting. A lot of players were hoping for a little more from the meteor, with a complete obliteration of Tilted Towers or even the entire map were the main theories being thrown around. However, it's not all about the meteor. Season 4 saw some additions - good and bad - which totally changed the meta. Double pump was and the explosive buff meant grenade launchers were suddenly unstoppable. The bounce pads and the drum gun were cool additions though, as was the jetpack, but that was removed within a couple of weeks. Shopping carts arrived as the first vehicle in the game but they weren’t very viable means of transportation, although they were - and still are - fun to mess around with. Infamously, season 4 was also the time when many players had to grind unhealthy amounts to unlock all of the Omega armour pieces. Multitudes of complaints were posted to Reddit, Twitter and the official forums about how much XP was needed to reach level 80 - the milestone where you’d unlock everything possible for the season. For many, the grind burnt out the enjoyability of the game. Kudos to Epic for the rocket launch however, as that was by far one of the coolest “be there or miss it” moments ever in gaming. Following that, the disappearing signs throughout the map and the real-life ARG built up a considerable amount of hype for Fortnite season 5, especially with rumours circulating of Fortnite fatigue. I can’t give a final decision on Fortnite season 5 because, well, we’re only just approaching the halfway mark, but so far there have been a number of pros and cons. On one side, there’s a big ol’ desert! Paradise Palms is a lovely change of scenery, the huge desert rocks everywhere make the biome look - and feel - a lot bigger than it actually is and the small old-timey cluster of houses in the south is one of the best landing spots this season. Lazy Links is pretty rad too and a more than satisfactory replacement for Anarchy Acres. RIP. Plus, you can actually play golf there with the new emote unlocked early on in the battle pass. Rifts are an innovative and fantastic addition to the game that really change up map traversal and hard-fought fights. ATKs are nifty and often absolutely hilarious, while the Viking Village is easily the most unique area on the map. Disappointingly though, the skins and emotes in the battle pass this season are fairly lacklustre. Ragnarok is fairly cool but he’s no Black Knight and aside from that, they’re all rather plain, coupled with the fact that, so far, there have been no iconic emotes like Take The L or Floss. That’s not even mentioning the sorry state the meta is in right now. Explosives and submachine guns are running riot in every game. A shotgun nerf was needed but nobody expected it to be this bad. Most players are forgoing the previously essential weapons like assault rifles and shotguns and are instead running with two types of SMG, two types of explosive and some heals. Epic is continuing to lower the skill ceiling for the game and so far, it’s making the game less fun to play. Here’s to hoping Epic realise the error of its ways before the season is out. Season 3 is when most players made their Fortnite debut. It kicked off in late February and it was all you’d read about or see, even in mainstream media. Fortnite season 3 gripped the world and it made it even more fun to play. There were no major changes to the map except for the addition of Lucky Landing, since players were still getting used to the new points of interest from the end of season 2 like Haunted Hills, Tilted Towers and Shifty Shafts, but the game was at its healthiest. Arguably, the best battle pass skins were found during season 3 too, as the space theme meant there were some really wacky outfits. Despite the stereotype often assigned to the Rust Lord skin, it’s still a damn cool outfit. Our favourite is by far the Dark Voyager, with the only disappointing aspect from the season 3 battle pass being the John Wick skin. He’s just so orange! Gameplay in season 3 was when Fortnite peaked too. There were a lot of veterans playing and even more newbies, there weren’t too many weapons and items available and while half the lobby would go to Tilted Towers every game, the map was in a solid state without too many minor points of interest. Players knew how to build in combat situations but it was rare to see the enormous build fights you see so regularly today. Overall, the pace of season 3 is when Fortnite felt at its best. Each fight felt fair, there weren’t many times you could outright claim a death wasn’t your fault or the game bugged out. It had its flaws, for sure, but they were few and far between. This is all without mentioning the immense hype drummed up by Epic as the meteor appeared in the sky. It hung there for weeks on end, nobody knew what was going to happen. I mentioned before that the outcome of the meteor in season 4 was disappointing, but the build-up definitely wasn’t. For us, Fortnite season 2 was the best Fortnite experience. From the vast majority of players diving out of the battle bus for the first time to the barren terrain that covered most of the map, Fortnite season 2 is what was expected from the term “battle royale”. Winning a game meant something back then, everybody played cautiously but not so much that every game was a camp-fest. Every game you played, you felt yourself learning and improving as a player. The majority of season 2 was what veterans of the game call the “OG” map. Pleasant Park, Retail Row and Greasy Grove were the three main points of interest and many of the built up locations we know and love today didn’t exist. Players often used the terrain to their advantage as it was hillier, putting less of an emphasis on building , which led to much tenser situations as players snuck around, adopting stealthy playstyles. 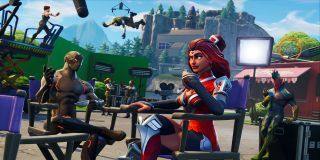 Season 2 was the first time the Battle Pass was introduced too, although there were only 70 tiers. It gave us three of the best emotes in the game though: The Worm, Ride The Pony and Floss, and the Black Knight is still by far the best skin in the game. If you get into a fight with a Black Knight, you know you’re going to have to be at your best to emerge victorious. Don’t discount the other skins either: Sparkle Specialists in this day and age are a force to be reckoned with. Perhaps the most insignificant yet important aspect of season 2 to those who played back then is the music. From the tune that played as the battle bus flew across the map to that iconic Victory Royale music everyone begs Epic to re-implement, Fortnite’s sound effects have gone downhill. Remember the old SCAR sound effect that made it sound like it was shooting lasers from Star Wars? Now it sounds too realistic and like every other gun, which is the aesthetic Fortnite should be straying from. Hopefully, we’ll be able to look back on this in a few months and put Fortnite season 6 and even Fortnite Season 7 up there with seasons 2 and 3. No doubt we’ll all be hyped in a few weeks for the season 6 teasers Epic are bound to introduce and if we’re lucky, the meta will be in a much better place before too long where SMGs don’t obliterate anyone in a few bullets. One thing’s for sure though: Fortnite is showing no signs of slowing down. What's the best Fortnite season in your eyes? Let us know in the comments below.